The year 2014 has been a great year for HCiActivate - HCI’s Go-Live and training division. 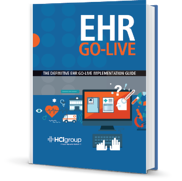 Now, for the first time, we have collected our many thoughts and pieces of EHR Go-Live advice into our first eBook. In it we discuss all the tips and tricks you’ll need to successfully take your project across the finishing line, as well as how to avoid some key Go-Live ‘gotchas’.